We have begun to unload our second firing . . . . and although we haven't even seen the firing in its entirety (oh, how we've had to learn patience! ), it could be said that the 'kiln gods' have smiled on us. With just days to go before our biggest and best show of the year, we are overjoyed to find beauty after beauty emerging from within the still-warm brick walls. We are feeling oh so very grateful! 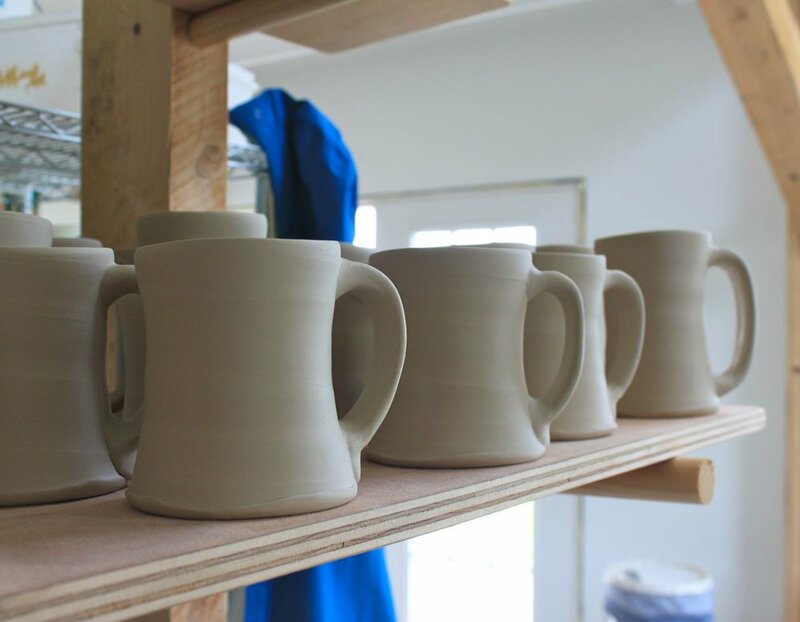 A few of our favorite mugs, cups, and more from our first firing! Our favorite wood-and-soda-fired baskets, bowls, and bottles from our very first firing of our new wood kiln. Next up: mugs, cups, and lidded things! The day of the unloading began with a few preparatory tasks, namely cleaning up and numbering the door bricks for an easy stack-up next time. Not so long ago, I might have rushed to take down the doors, pulled out everything, and then been faced with a giant mess to clean up . . . but three years of kiln building and a very methodical partner have had a good influence . . . namely in the form of patience! 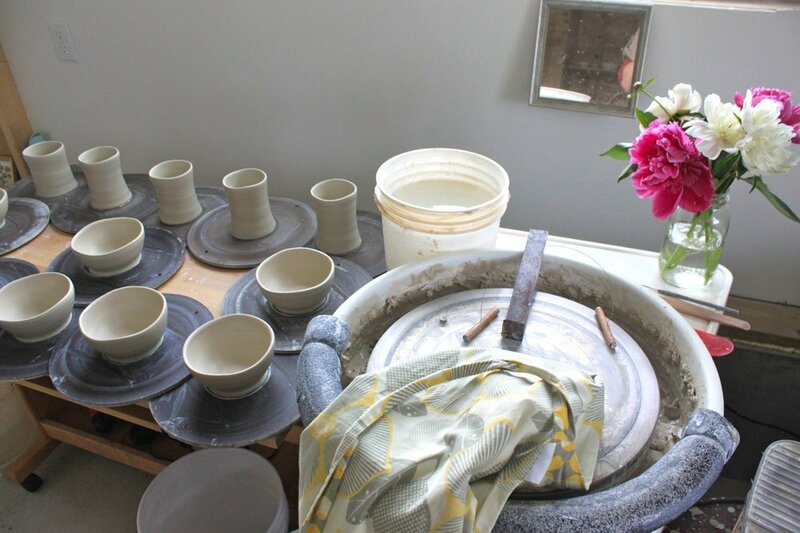 We even vowed to clean and grind kiln shelves and posts as we went; four shelves of pots to unload, four to grind. Nonetheless, there was a definite sense of excitement as we took out the bricks and got our first good glances. Holding our breath . . . our first reactions were mixed . . . initially the pottery looked OK, if a bit on the pale side. (We do tend to prefer lighter tones from the wood kiln as opposed to dark browns, so this was at least visually unobjectionable.) What we quickly realized, though, was that most of what we found in the middle of the kiln was dry. Under-fired. Too crusty, and perhaps not even water-tight. Ugh. At least we're a few hundred pieces closer to our next firing! We continued on like this for almost an entire day, filling up the tables with pieces to be re-fired. We took a quick trip to the river for a bit of helpful perspective, no doubt feeling a little down, but heartened somewhat by the fact that we didn't find any major disasters, and that the flashing and ash colors looked pretty nice, for the most part, knowing it just needs more heat! Why didn't we keep firing if it was so cool? The cones in front of the kiln showed cone 12, and the stack just behind was not far behind. We didn't want to risk over-firing the front, but in retrospect, we should have kept firing and sacrificed a few pieces in front for the good of the rest of the kiln. We also hoped our side-stoking efforts would even things out, but we just didn't stay hot-enough for long enough. The biggest thing we struggled with during the firing was the un-eveness of temperatures from front to back, top to bottom. Our chimney is HUGE, which means it pulled much of the heat across the floor and out the stack, even with the dampers at 10%! Also, our burn was very, very efficient with all the built-in air channels, so much of the chamber was oxidized as we missed out on a lot of the reduction cycles that contribute to richer colors. At nearly 6pm on the first day, Nathan decided it was time to take down the door to the soda chamber. We were hoping we would see something to lift our spirits. (I can't believe we hadn't opened it yet!) And we found beauty . . . ahhh. We each took a deep breath of relief to find gorgeous flashing slips, melted glaze, and lovely effects from the soda. Most of what we could see looked really nice- we felt saved by the soda chamber! With that good news, we called it a night. Back at work the next morning- already 92 degrees at 8am- we finished unloading the rest of the first chamber, and found a few gems in the rough. Some places were hot enough to melt the ash on the surfaces (that is, if the pieces hadn't cracked)- the very front stack had some nice ones, and the areas around the flues at the back of the chamber were lovely, too. We started in earnest unloading the soda chamber in the extreme heat. We found lots of beauties- finally some ware boards of pottery ended up on the 'to sell and photograph' table! The melt was good, and while the chamber wasn't without issues of its own, we had a much better success rate overall. We are hoping and scrambling planning to fire again in a month, before our biggest show of the year. We have a new road map, changes planned, and a lot to do . . . and are already excited to try this again! Next up: A proper photo shoot of the newest work, and hopefully a select few posted to our online shop soon. Two years, eleven months, and sixteen days after breaking ground on our two-chamber climbing kiln, we lit the first fire. Stacked with over 700 pieces of mostly raw and unfired pottery on 121 kiln shelves, we were ready to see how our creation actually worked! We were really pleased with our firebox design, which is a sort of stepped down staircase filled with air channels for efficient burn. The four-foot lengths are stoked first through the opening in the bottom of the kiln, and eventually through the doors on top, alternating, and stoking wood every 5-10 minutes. The slab of wood sits on the 'stairs' and burns all along its length. Below is a photo of the inside of the firebox taken before we loaded the kiln. Side stoking (putting wood into the sides of the chambers in addition to, and then instead of the front) began in earnest in the wee hours of the fourth day. At that point, the pyrometer (basically a high-temp thermometer) we had salvaged had ceased to give us a reading (it only went to 1,999!) so we were firing solely using cones and blowholes (pictured above) as indicators of heat and internal atmosphere. By hour 90 or so (the morning of the fourth day), we had reached cone 12 in the front of the kiln, and needed to stop stoking there, and move onto solely the side stoking ports in the back of the first chamber, and in the soda chamber. The narrow gauge dry wood ignited on contact. Thankfully, we had great help at this point. Our friends Kaitlyn, Sarah, and Matt (all potters!) showed up with food and most importantly, fresh energy. At this stage, we were both running on very little sleep, but nonetheless feeling energized and excited by all that was going on. (Thank you, adrenaline.) If the rest of the firing were a slow jog, these last few hours were a flat-out sprint. We moved quickly to get the soda chamber infused with soda (soda ash mixed with some whiting and borax, made into a paste, and stoked into the kiln on boards), and to raise the temperature evenly throughout. We checked cones and pulled draw rings, and were pretty happy with what we saw. We would have liked it hotter in some places, and cooler in others, but that's wood-firing! (Especially the FIRST wood-firing.) By eleven-fifteen that morning, after 94 hours of firing, we were ready to shut it down. All the plugs went back in, the damper was closed, and we did a wee bit of collapsing celebrating. It's safe to say that regardless of the results, this first firing was a huge success in many ways. We are grateful for the experience . . . and hoping and waiting for at least a few (?!?) nice pots. P.S. Cooling takes an entire week. Stay tuned. We can hardly wait. What a joy to be inside the kiln for the first time, getting a feel for the space, assessing the layout of our new shelves. 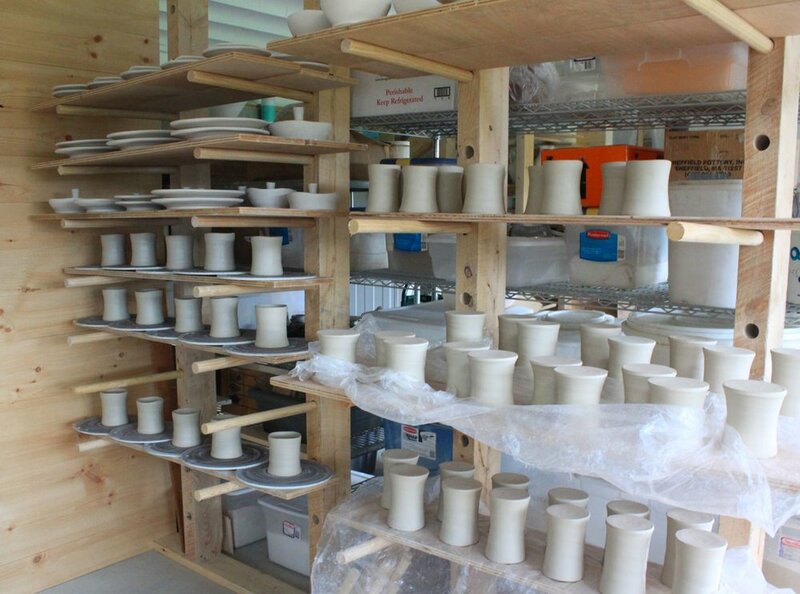 This first kiln loading was a long one for a number of reasons, not the least of which was determining the best use and layout of the kiln shelves we had, and painting every one with kiln wash (alumina + kaolin mixture) to protect them from dripping, melting ash. (A huge thank-you here to our kiln shelf shareholders for helping us purchase all these beautiful new and new-to-us shelves!) We were also cutting posts (pieces of brick) on the wet saw as we went, and pausing here and there to take it all in . . . I had forgotten how much excitement and promise and well, let's face it, tediousness towards the end, comes with loading a kiln. It had been over four years since either of us had last loaded a wood-kiln, and it felt beyond great to be back in the swing. All said and done, 720 pieces of pottery, large and small, fit onto 121 kiln shelves. And then we bricked up the door . . . I think it's safe to say . . . we LOVE our kiln. Let the stacking of pottery begin! The most exciting part of all this was that we were ready to burn out the wooden form on the kiln's interior! OK, almost . . . we did build little brick culverts around the passive dampers in the flue, raised the retaining walls between the soda chamber and the chimney, and they filled them by hand. By Friday, we were ready for burn-out. Before we lit the first match, there was still a bit to do . 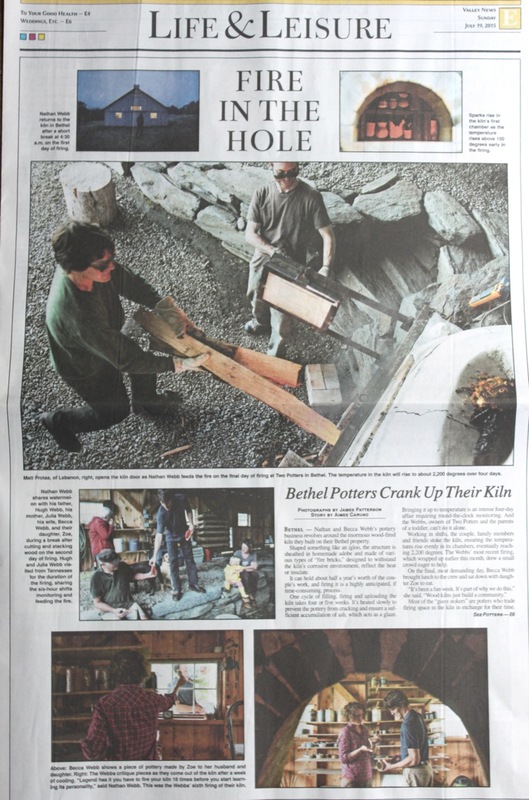 . . stuff the kiln with newspaper, and brick up the doors. We crawled in and around the plywood forms, stapling large clusters of crumpled paper to the arches and the lathe, and leaving little pieces of kindling every which way to wick up the flame for a complete burn. We weren't entirely sure how the burning would go, and wondered if we'd be pulling charred chunks of wood out later. Um, yeah, let's just say it didn't quite happen like that. The fire started easily enough, dry newspaper catching quickly, and before long, light gray smoke was seeping out of every crack, but most especially out of the chimney, indicating good draw. Yippee! Soon, however, that light smoke turned to thick, black smoke chugging away with great force . . . and I was on the phone to the fire chief, the neighbors, anyone I could think of who would no-doubt be thinking that our house- or something very, very large- was burning down. We even had some random passers-by pull down the lane to ensure everything was OK. While Nathan tended to the kiln, I assured everyone that it was contained and safe, apologized for the smoke, and reassured folks it would never be quite this smokey again. Which is true- as compared with our future firings, this was a far colder - only 500 degrees- and therefore dirtier fire with more combustible material smoldering burning than we will ever stoke into our kiln at one time. When I returned to the kiln site, the form in the first chamber was GONE. (Apparently, there would be no charred remains to be taking out with the saws-all!) The second chamber collapsed soon after and disappeared quickly. We sat in the front by the stoking doors, mesmerized by the flame as we watched it bring light to the shape of our new kiln. During a typical firing, we will see mostly the front stack of shelves, posts, and pottery, so to be able to see the entire kiln filled with fire- straight back to the flues- was an unexpectedly delightful experience. The next fire we build will start more slowly, but burn oh-so-much hotter . . . we hope to be reaching 2400 degrees two weeks from now, if all goes well! Stay tuned. thank you kiln shelf share holders! A HUGE thank- you to those of you who helped us get to this point. We are so grateful for your support and encouragement, and will be thanking you in the form of new pottery very soon . . . 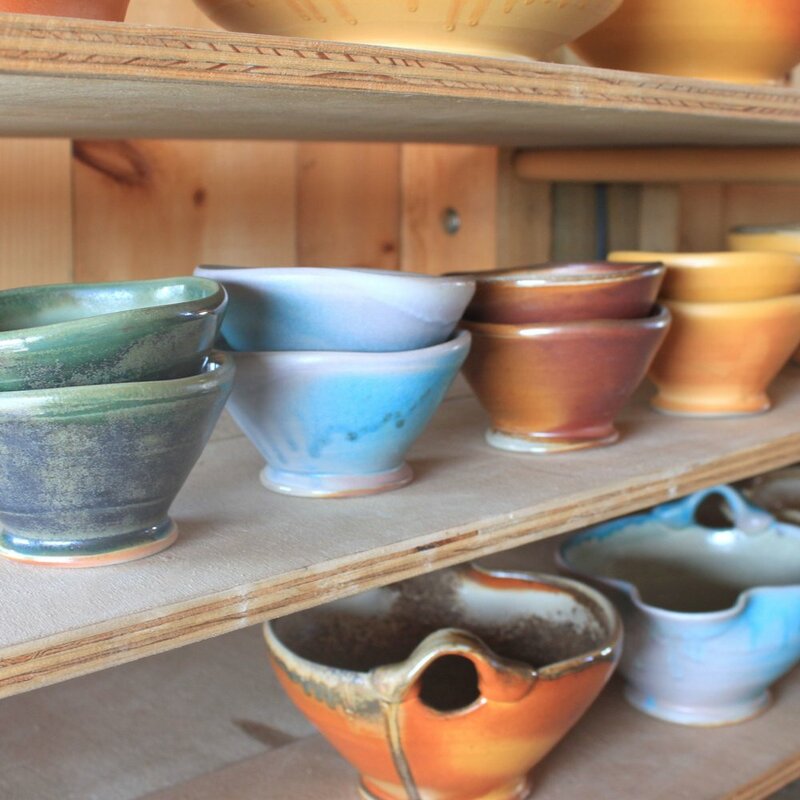 If you have questions about your share, or our kiln shelf shares program, please feel free to contact us at nathanandbecca@gmail.com. By some wonderful coincidence, an record-breaking stretch of warm (hot) weather has descended upon us in conjunction with Nathan's spring break from teaching pottery at Dartmouth. 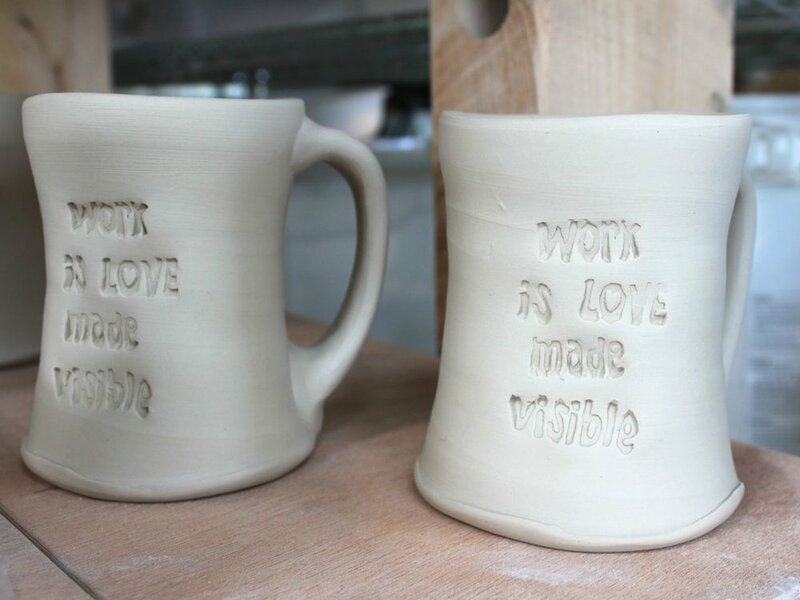 For us, this means two solid weeks of 10-hour days putting some of the 'finishing touches' on our kiln. We couldn't be happier! I leave you with this shot of the completed-with-newly-refurbished-transom-window back wall of the kiln shed. Stay tuned for some photos of the finished surface in the coming weeks. A quick photo comparison of the past couple of months (January 2012 to March 2012) . . . we spent a good portion of January outside in the odd non-winter weather working on the kiln shed, and we LOVE how things have changed out there. Aside from now being 10 feet longer, the shed lost its unsightly, windblown tarp of a back wall (that was up for well over a year), and has graduated to an actual back wall of lovely local ship-lap siding. (This works oh-so-much better at keeping out the snow, now that winter has finally decided to arrive!) But the best part of all is the 'sky-lights' we installed between our roofing panels. It's amazing how much light that brings into the back of the building . . . and we're looking forward to even more light in the form of windows along the west wall, and the eventual disappearance of rusty-metal tin roofing-turned-siding that is keeping the snow out! It sometimes it seems these little improvements are even sweeter because they didn't happen right away . . . good things made even better by the simple fact of waiting and dreaming . . .
What we did know was that the chimney had to clear the building for good draw and for safety's sake (at peak temperature, the chimney will spew an amazing flame several feet in the air, and our shed is built of, you guessed it, wood) so we positioned the scaffolding around the base, and rigged up a pulley + milk crate system to get the bricks from Becca on the ground to Nathan on the chimney. And then we hauled and hauled and hauled, and leveled and laid, and leveled and laid . . . here are few photos of our autumn chimney building! We got a little help from Becca's family early on. (Dad was a very eager hauler!) Lego, not so much helpful per se, unless you consider cute-ness to be a morale booster. Bricks waiting for their trip up. Becca did most of the hauling, while Nathan did most of the brick laying. These bricks weigh about 8 pounds apiece! I guess we're feeling pretty strong after this part of the project . . . phew. For a good portion of the chimney, we used a double-thick stack, with each of those courses using 32 bricks. And with each course we gained 2.5 inches of height. Yup. Once we switched to a single course, things went much faster, only 14 bricks/course. Ta-da! (OK, there's still a bit of work to do in the little arch, but hey, we think it's looking pretty good!) Now, on to insulation . . . Early signs of fall are all here, with just enough of a nip in the air to remind us that time is of the essence if we're going to (hopefully!) 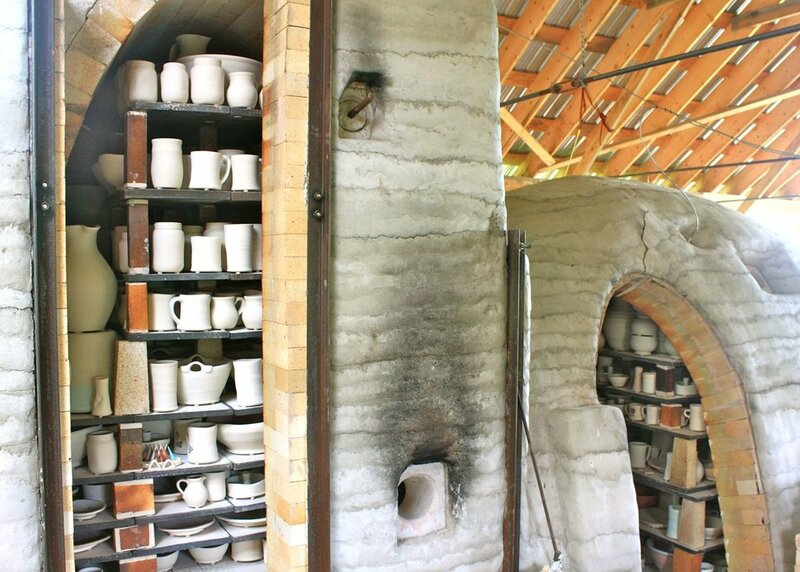 get this kiln built by winter. We've buckled down, completing the hard brick arch on the big chamber, the soda chamber, the soda chamber walls, and moving onto the collection flue (i.e. tapered arch that connects the kiln to the chimney) and the chimney foundation. Nathan holding Lego's paws in silhouette on the kiln . . . oh, and a dear friend recently asked us if we'd be eating a lot of clams- what else could explain the countless buckets of clam strips that appear in seemingly every photo we take?!? The truth is that a local seafood shack offers up these sturdy little buckets for re purposing, and they hold our shims, brick pieces, castable, brick packing mix, you name it. Magically, amidst the hustle and bustle of our summer show season, we enjoyed a string of days kiln building, interrupted only by afternoon swims in the glorious White River and the occasional maple ice cream. We have nearly finished the hard brick on the first chamber of our large kiln, and are enjoying the momentum that eight hands working has created- thank you, family. And now a twelve-day pause for our biggest and longest show of the year . 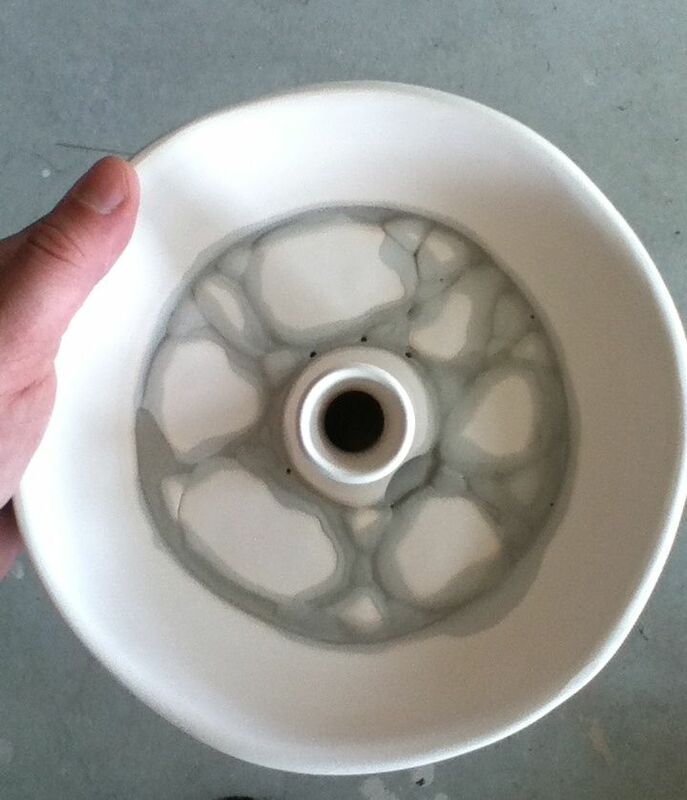 . . we'll be sharing more of our kiln work in late August! These days we are: -Enjoying the arrival of summer, bashful as she may be. -Finding hours here and there for brick laying, and closing the gap at the top of our form! We are: -Constructing the side entry door to the big chamber and weaving bricks in and around it. -Watching the door to the soda chamber slowly take shape, and finding the ports we cast this winter their forever homes. These days, we are also: -Mixing work and home life (always!) -Spending time with family, drying next winter's wood, putting in fence posts, and watching the garden grow . . .
We hope this last day of June finds you well!